Scanned image George P. Landow; text by Jacqueline Banerjee. The Roman Catholic church of Our Blessed Lady and St Thomas of Canterbury, to give it its full name, is one of Pugin's earliest churches. A Grade II listed building, it was built of local stone in 1838-1841, and consecrated in 1842. It is situated on St Joseph's Street Dudley, in the West Midlands. Simply planned in imitation of the traditional Early English style parish church, it has a south porch, lean-to aisles each side of the nave, a chancel and stained glass windows including a rose window and triple lancets. It was built to accommodate 600 people, and fitted out "with all its furnishings, vessels, vestments and stained glass" for the reasonable sum of £3,160 (Fisher 24). 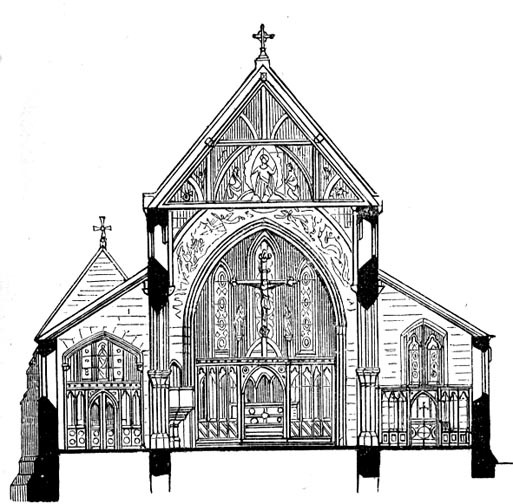 The furnishings shown in the illustration include the rood screen across the chancel arch and the screens at the end of each side aisle. It never got a tower, and, like so many churches, was much altered in the 1960s, losing most of its fittings, having a low ceiling put in, and some extensions added. Pevsner was dismissive ("small in the aisles.... Short chancel," 121) but it is hard to judge it in its present form. Fisher, Michael. "Gothic Forever": A. W. N. Pugin, Lord Shrewsbury, and the Rebuilding of Catholic England. Reading: Spire, 2012. Print. Pevsner, Nikolaus. Staffordshire. The Buildings of England series. New Haven & London: Yale University Press, 2002. Print. Pugin, A. Welby. The Present State of Ecclesiastical Architecture in England. "Republished from the Dublin Review." London: Charles Dolman, 1843. Print. "Roman Catholic Church of Our Lady and St. Thomas, Dudlley." British Listed Buildings. Web. 21 November 2012.